BOGG is now available in PDF format: The latest system-agnostic setting for science fiction RPGs from As If Productions. 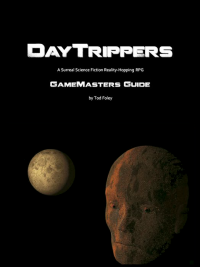 A far-flung world for your science fiction or alternity roleplaying sessions, suitable for one-shot adventures or extended campaigns. Legends of Tabletop AP 10 - "A Fistful of Orchids (part 1)"
One of the hottest in-vogue items this year is the Inranian Orchid, a large and beautiful flower from a deadly planet on the other side of our galaxy. When the world-famous hamloaf heiress Scylla Sardacian requests a shipment of these flowers (as many as she can get, for conspicuous consumption), Bento begrudgingly hands the assignment to Nash. Then we're off to a hexcrawl on the planet Inra, where our heroes face a harrowing combination of inclement weather, hostile predators, and rival orchid-seeking DayTrippers. Do you play DayTrippers online? Click the download link below to grab a copy of this PC Sheet in fillable PDF format - now with autocalculation! Legends of Tabletop AP 9 - "Birthday Bash"
After a session of collaborative setup, we enter a Dream World where the world-famous Scylla Sardacian is throwing her own birthday party. DarkMatter has been hired to provide security for her and her guests, which means that Nash and Reggie, along with their team, will be babysitting a group of spoiled celebrities. The party takes place on the planet Paralaxus, where we also encounter the rival DayTripping firm of Hanfast Security. Read more about Legends of Tabletop AP 10 - "A Fistful of Orchids (part 1)"
Read more about Legends of Tabletop AP 9 - "Birthday Bash"
Legends of Tabletop AP 8 - "There's No Going Back"
Nash and Reggie are given yet another set of identities as they meet their new teammates at DarkMatter Inc. Unfortunately Bento has decided not to help any further, and our heroes have to take things into their own hands under cover of night. 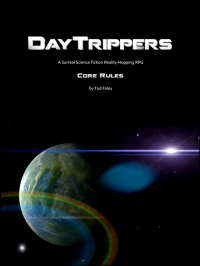 Read more about Legends of Tabletop AP 8 - "There's No Going Back"
Excerpted from the DayTrippers Core Rules, I bring you the story of Zayim Diaspora: the first DayTripper. Legends of Tabletop AP 7 - "Press Junket"
While Chip undergoes detox at Diaspora Ranch, Nash and Reggie (under their new identities) meet with the guys from DarkMatter Inc to discuss their situation, and a plan is put together to get inside Somnambula Inc's headquarters, where they suspect Suzie is being held captive. Read more about Legends of Tabletop AP 7 - "Press Junket"
SIXTEEN SCIENCE FICTION SETTINGS FOR YOUR CAMPAIGN!